Please take a look at our new sign at Sun Lakes Country Club. This sign replaces the small yard sign and with the removal middle insert we can put the title of each meeting on the velcro under the sign. We will keep the older inserts and Sun Lakes Country Club will keep our sign and put up around 2 weeks before our meeting. Keep in mind the insert costs $50 so we need a big yard sale in November and dues from our members and a good 50/50 each month. The Sun Lakes Republican Club provides education to citizens, develops leadership among its members, promotes the election of Republican candidates, encourages loyalty and support of the Republican Party, and works toward the betterment of the community of Sun Lakes, Arizona. Meetings are held on the second Tuesday of each month, at 6:30pm in the Arizona Room of Sun Lakes I Club House, 25601 S. Sun Lakes Blvd. The public is welcome. Responsible spending honors and respects the value of the individual’s earned income. The economic prosperity of each citizen and the security and sovereignty of our nation is dependent on a balanced budget. Unlimited and unsustainable deficit spending and government “bailouts” have created an insecure economic future for our generation as well as for our children and grandchildren. This increasing national debt threatens our sovereignty as a free nation and the personal and economic liberty of future generations. The Constitution is the supreme law of the land. We believe and defend the Constitution of the United States that limits the power of the federal government. 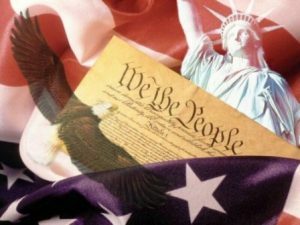 We support and defend the tenth amendment that states “The powers not delegated to the United Sates by the Constitution, nor prohibited by it to the States, are reserved to the States respectively, or to the people.” Our founding fathers knew that government needed limitations in order to prevent tyranny of the people and usurpation of our freedom. We believe in and support a free market economy that allows all individuals to exercise their personal liberty and to pursue the “American dream.” We oppose unconstitutional government intervention into the operations of private business. The founders believed that individual liberty could not exist without economic freedom. The more the government controls our free markets, the fewer choices consumers have. All Americans have the opportunity to pursue life, liberty, and happiness. We defend the individual’s freedom of choice as long as it comes at no expense or harms others, while respecting the freedom of others to do the same. We believe it is personal responsibility and economic freedom which lead to prosperity. We do not believe in the welfare state. We accept the consequences of our choices.